This month, AOW connects with Laura Siegel of Laura Siegel Collection, a designer of artisanal apparel. Laura shares her honest feedback on how she’s navigated one of the trickiest sectors of the industry, managing quality control, design limitations and consumer demand to build a strong and growing brand. Tell us about the work you do and how you first got into artisan-made apparel. During and after studying at Parsons in New York and London's Central Saint Martins, I took several sabbaticals to travel and work abroad. I spent a significant time with communities where craft was an integral part of their livelihood (India, Bolivia, Vietnam, Laos, Indonesia, etc.) as well us working for designers that specialize in working with artisans, including Megan Park. I saw from those experiences how much potential was out there to connect craft with the fashion industry. 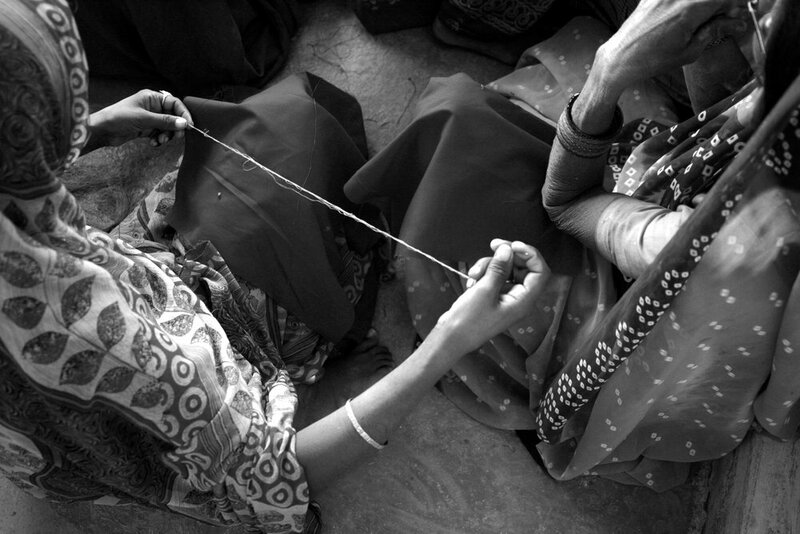 I've been working with artisans to develop and design textiles and womenswear since 2009. I do this for my personal collection, as well as in partnership with other brands and retailers. Ultimately, my goal is to give artisans a contemporary platform to keep their ancient crafts and techniques alive, while simultaneously building brands through strong creative direction. When it comes to artisan-made goods, there is a plethora of home, gift, and personal accessories in the marketplace but a lot of room for opportunity within the apparel market. Why do you think this is? When you think of the apparel market generally, outside of the artisan sphere, there are an infinite number of things that can go wrong when it comes to managing sizing and quality control, not to mention supplier timelines, price points, etc. So it can be intimidating to think about running a truly sustainable, human-centric apparel business where everything - including sizing to supply chains - is that much more fragile. More pointedly, turning artisan-made textiles into wearable womenswear is extremely challenging from a technical standpoint. We need the textile to suit fluidly on the body, and also have a lasting quality, which limits us to a small set of particular fibers and sources. That’s not to say it can’t be done, but a designer really needs to have mastered textile techniques and design to get this right. Luckily, working with my artisan partners over the last 10 years has really given me an advantage in this regard, and allowed me to explore hundreds if not thousands of possibilities within each textile technique. While it’s hard to keep up with fast fashion, we’re definitely seeing a shift in consumers’ mindsets when it comes to sustainable, artisan-made goods - the demand is greater than ever before and only growing! Luckily, we’ve been focused on artisan collaboration from day one so that’s given our brand a bit of an edge in the market. But it’s not just about giving in to the “sustainability” trend. At the end of the day, I truly believe that handmade designs are more beautiful than industrial-made goods, and that handmade quality cannot be replicated by machinery. Many of our customers have been buying the brand for years because they love our aesthetic and appreciate our quality. They also see that LS brings something new each season from a textile perspective, something they can't get anywhere else on the market. We develop 20-30 textiles each season, encompassing embroidery, weaving, knitting, tie-dye and more. When it comes to marketing, do you feel it’s crucial to "push artisan" or do you let the clothing speak for itself and allow consumers to discover the impactful stories on their own time? For the most part, I have tried to let the clothes speak for themselves. I love to promote milestones and achievements when we've made progress with particular groups and techniques, but we also want to make sure we are not exploiting or “tokenizing” any of our partners. But if I’m being honest, historically we’ve been so focused on the “work” that we haven’t invested as much in marketing as we should have. That’s something I’m going to prioritize in the year ahead. Many of our readers are interested in ethical apparel but are fearful of jumping in because of quality control issues. How do you manage your quality control? The best way to manage quality control is by designing from the start with a thorough understanding of the craft and maker. Each technique and artisan will have their own strengths and limitations. If you understand those limitations and design around them, it makes the process much smoother for everyone involved when manufacturing. It is a massive help to hire designers or consultants with a deep understanding of the artisan landscape when doing textile development. It makes the process so much easier and opens up a world of design possibilities. For new businesses, building a strong supply chain from day one is important. Spend the time researching all options and assessing through trial and error in the initial phases before launch. How many collections do you produce per year? How are your new lines launched? For the past 8 years, we’ve been following the calendar, producing two collections a year. We’ve been showing at trade shows (Woman, Capsule NY, LAM, Paris, Dallas, and a few others) and through private appointments with our showroom in NY and LA. Our current business model is predominantly wholesale, with only a small percentage of sales coming from our e-commerce site. This, to be honest, does not allow for any error. Whether you’re in the artisan sector or not, timeline and quality control will always need full attention. It is a part of the wholesale manufacturing game that you buy into as soon as you commit to the seasons. That being said, it is an older model. We are in the process of restructuring entirely and considering all these thoughts when planning ahead. We are also growing our consulting branch helping a very small, select group of brands and retailers grow in the artisan space [mostly through curation, design development, and brand identity]. In terms of wiggle room when things go wrong, you really need to plan for that and learn from each error. Improvising and maintaining a positive attitude through the process is essential but implementing new practices after each error is key. What do you do when things do go wrong? How do you work to prevent these mistakes before they happen? Best advice: don’t sweat the small stuff, make do with what you have and think on your feet. If it’s possible and there’s time to remake the sample, we proceed with that direction. If it’s too late and it’s a size issue, we re-fit and alter, if it’s a color issue we might just pull it from the shoot or collection all together. Our most extreme case would be when key pieces from our Spring/Summer ’18 collection shipped from India and in a very rare scenario took much longer to arrive to New York than we expected for the shoot. In this case, we were extremely lucky to have a solid team, what feels like family, all willing to come back to shoot an extra day for a few hours to make sure we got those pieces in. I feel forever grateful for that. Typically I would not make such a big fuss, but when making these pieces, I felt they were some of our strongest pieces in the collection which sales turned out to prove correct. How to prevent? Always allowing for more time is a nice option if you can, but at the core of it, what has saved us so many times, is having a thorough quality control system set up within our supply chain, with regular training programs and increased levels of communication. I’ll also go back to the point of designing with production in mind and understanding each craft’s limitations. The more you understand the process, the more you can see where things have the potential to go wrong or cause delays, so you can design around that. If you can hire a designer or consultant with this understanding, you will see a difference in the production process. Do any of your clients ask about the production of your goods? Most don’t ask as they are predominantly interested in the product itself or have a thorough understanding of its production from buying the collection for so long. They feel good and care that the product is coming from a good place but design is at the core of why they buy. I imagine it’s hard to be creative and design while juggling all of the day-to-day responsibilities of operating a business. What jobs do you hire out? All operational jobs (shipping, accounting, etc..) are delegated. I would love to grow the design team and bring in someone to do marketing to really share the story of the artisans we work with in a light that honors their craft. What are some of your favorite publications when it comes to trend forecasting? I don’t look at trend forecasting publications. My travels are a huge source of inspiration, along with natural wonders and the odd things nature provides. I was recently in Semuc Champey in Guatemala, for example, and found the craziest shapes and lines in nature I’d never seen before (crazy tree roots, fungus, water pools, etc). Who within the industry do you look up to or admire? The work Donna Karan’s done with urban zen has had a huge impact on my outlook on possibilities within this space. Not necessarily a brand but an individual that I’ve looked up to throughout the years: Marcella Echavarria, a Mexico City based woman that’s been working with artisans for decades to help grow the overall sector. Tara St James (Study NY) is one to learn from also, from a zero-waste perspective. What do you wish you had known when you first got started in this business? I cannot emphasize enough how crucial it is to focus on setting up a strong supply chain from day one. Work with people you can feel confident will deliver on time and with the quality necessary. This will help to avoid unnecessary costs down the road and the need to do trial and error after launching, simultaneously while growing the business (which can definitely take a toll). At the moment, we are working on some really exciting projects within the LS brand that allow us to stretch our muscles beyond just womenswear, but also continue to collaborate with partners and artisan focused brands on design development and creative direction. There is a ton of untapped potential and talent in the artisan world, and I hope to be able to continue to connect partners in the space and scale the industry. On one side, there are artisans with unparalleled talent and unseen product, and on the other, there are retailers and brands that are looking to differentiate themselves with beautiful and unique handmade products. Do you have a topic which you would like to address via an Insider newsletter, or recommend AOW interview someone? If so, be in touch. We would love to hear from you.